With over a decade of experience in collecting & processing of domain Whois data, we have the most comprehensive Whois data bank which is not only accurate and well parsed but also provides our users with access to real-time as well as historic data for their research. With almost all the existing TLDs covered in our database, the list is continuously growing each day and at present, we have 2000+ TLDs. So good and reliable data is checked from the list! As for point 2, we are constantly updating our various products & services keeping our user feedback in mind. These iterations are made keeping in mind how this data is getting used by the end-users and what the purpose of this data is. With that purview, we have recently worked on one of the products that our users depend on the most i.e. 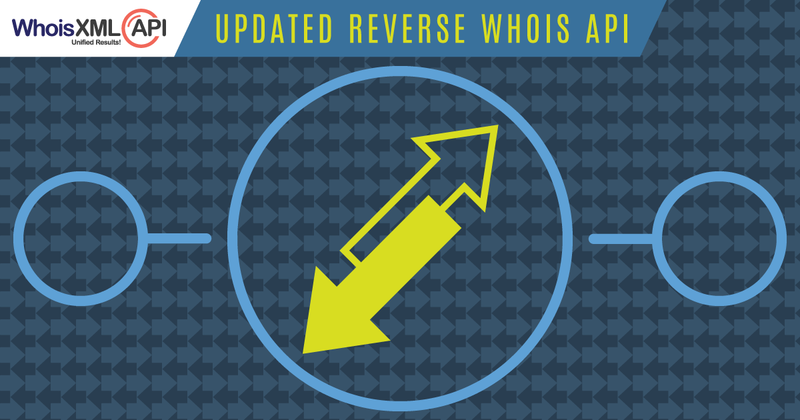 Reverse Whois API, which helps identify domains owned by a specific individual or company. Today WhoisXmlApi announces a significant update to Reverse Whois API, focused on filtering of data to provide more relevant results, along with a great improvement in the technology used which will help the overall user experience. Queries made for each search term in Reverse Whois usually ends up displaying numerous result sets, many of which may not be relevant. Our users wanted the ability to narrow down on domains and domain-owner criteria in the result set, to filter out unnecessary domains, to increase the relevance of the results and make it more precise. We have attempted to accomplish these most important criteria with this new release! Because of this filter, your result set will include only domain records where your search term is present in the Admin email address. Isn’t that great? So now users don’t need to look through hundreds of irrelevant domain records anymore. And what’s more, with various permutations and combinations of Section and Attribute, users have more than 50 attributes they can search within. Users can also further filter results for their search terms based on the various Record dates that are present in the Whois records. So if you would like to filter your search term based on its Created Date, Expiration Date, Updated Date, then you now have the option to do so. This can be a very important tool to help you monitor and track domains. To further narrow down your result sets, you can select the match type for your search term too. So now users can select Exact Match, Begins With, Ends With or Anywhere filter to their search term to get even more meticulous results! These additional filters will surely make our users’ domain research much simpler and concise. The more you narrow down and specify various criteria, the closer you are to hitting a home run! Besides this, the ‘Exclude term’ filter will also continue to be there, to further enhance your data research. In addition to the inclusion of this awesome filtering feature, we have also adopted an advanced Java architecture for our Reverse Whois API system. With an addition of the latest advanced storage system, and caching technology using state of the art Apache Solr setup, the API calls are now going to be more than 500% faster! So in effect, this new update is going to be a complete time saver, right from reducing irrelevant domain records to being much faster! Do leave a comment if you have any queries on the same. Keep watching this space for more updates.